My favorite dish to order at Mexican restaurants is fish tacos. I love the combination of flaky white fish, crunchy red cabbage, creamy avocado, and bright flavors from the lime and cilantro. But let's face it: when you have serious fitness goals, you probably aren't frequenting Mexican restaurants. The chips and salsa alone do me in! I was determined to come up with my own healthy version of fish tacos. This recipe is sure to make you forget you're dieting! Set oven to 375 degrees, wrap tortillas in foil and warm in oven while cooking tilapia. Heat coconut oil in medium pan over medium heat. Season tilapia filets evenly with all spices. Place filets in pan and cook 3-4 minutes each side, or until cooked thoroughly. Once tilapia is fully cooked, assemble tacos. 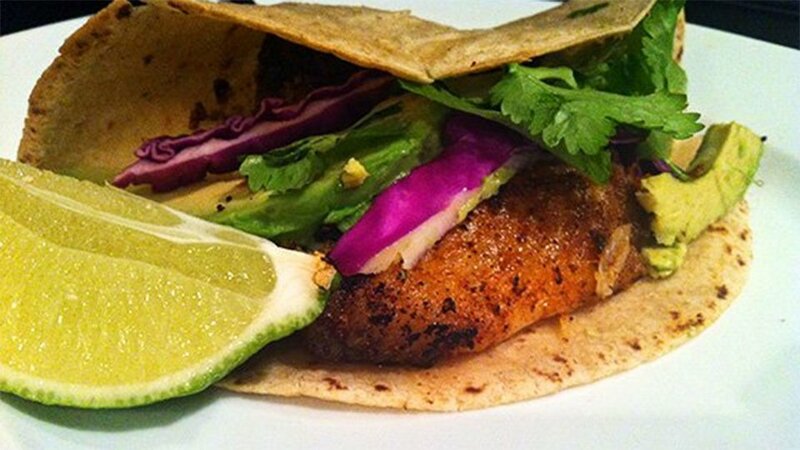 Place one tilapia filet in each corn tortilla with 1/4 sliced avocado, red cabbage, and garnish with cilantro and lime. Note: Add 1 tbsp fat-free plain Greek yogurt for a great sour cream alternative!